1 H NMR (400 MHz, CDCl3) d 2.23 (3H, s), 2.69±2.74 (2H, m), 3.77±3.82 (2H, m), 5.33 (1H, s), 5.49 (1H, s), 6.73 (1H, s), 6.85 (1H, s), 7.31±7.42 (10H, m). Imidafenacin (INN) is a urinary antispasmodic of the anticholinergic class. 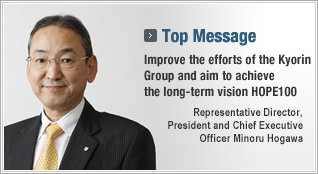 Imidafenacin was approved by Pharmaceuticals Medical Devices Agency of Japan (PMDA) on Apr 18, 2007. It was marketed as Uritos® by Kyorin, and marketed as Staybla® by Ono. Imidafenacin is a potent M1 and M3-subtype antagonist indicated for the treatment of urinary urgency, frequent urination and urgency urinary incontinence due to overactive bladder. Uritos® is available as tablet for oral use, containing 0.1 mg of free Imidafenacin. The recommended dose is 0.1 mg twice daily, and it can be increased to 0.2 mg twice daily, if the efficacy was not enough. Imidafenacin, the compound of formula (I), is an antimuscarinic agent marketed in Japan under the brand name Uritos® used to treat overactive bladder, a disease defined by the presence of urinary urgency, usually accompanied by frequency and nocturia, with or without urge incontinence. Overactive bladder dysfunction has a considerable impact on patient quality of life, although it does not affect survival. This route of document JP3294961 B2 implies several drawbacks. Firstly, purification of intermediate (III) is carried out by means of chromatographic methods, which are generally expensive, environmentally unfriendly and time consuming. Secondly, the hydrolysis of the nitrile group is carried out under strong acidic conditions and high temperature not convenient for industrial application. The use of a synthetic adsorbent is associated with problems with operativities and purification efficiencies from the viewpoint of industrial production, therefore, the process disclosed in document JP2003-201281 is not suitable for industrial application. EP1845091 A1 discloses a process for preparing imidafenacin, according to previous document JP2003-201281 , however the purification step is carried out by either preparing the hydrochloride or the phosphate salt of imidafenacin followed by neutralization as shown in Scheme 3. Purified imidafenacin is provided in low yield, overall yield of about 31 % (as calculated by data provided in document EP1845091 A1 ). This process has several disadvantages. Firstly, EP1845091 A1 states that the penultimate intermediate, the 4-(2-methyl-1 H-imidazol-1 -yl)-2,2-diphenylbutanenitrile phosphate is hygroscopic, which implies handling problems. Secondly, the additional steps carried out for purification increases the cost of the final imidafenacin process and the pharmaceutical compositions containing it, which already resulted in expensive medications. The intermediate phosphate salt of 4-(2-methyl-1 H-imidazol-1 -yl)-2,2-diphenylbutanenitrile obtained and used in prior art processes is a solid form having needle-shaped crystals, which are difficult to filtrate. Moreover, said needle-shaped crystals are very hygroscopic and unstable and transform over time to other solid forms. In addition, the water absorbed by this solid form described in the prior art may react with the intermediate to generate further impurities. 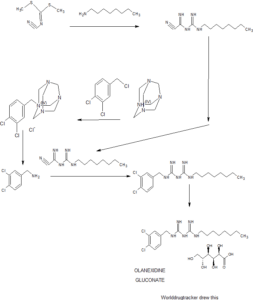 Therefore, there is still a need to develop an improved industrially feasible process for the manufacture of imidafenacin in good purity and good yield, involving the use of stable intermediates having also improved handling characteristics. 4-bromo-2,2-diphenylbutanenitrile (II, 1.000 Kg, 3.33 mol) and 2-methylimidazol (1 .368 Kg, 16.66 mol) were heated in DMSO (0.8 L) at 100-105 °C for 7 hours. The solution was then cooled to 20-25 °C and toluene (2 L) and water (4 L) were added and stirred for 30 minutes. After phase separation, the aqueous layer was extracted with toluene (1 L). Organic layers were combined and washed twice with water (2 x 1 L). Distillation of toluene provided 4-(2-methyl-1 H-imidazol-1-yl)-2,2-diphenylbutanenitrile as a brown oil (0.915 Kg), which was, then, dissolved in dry acetone (3 L) and water (0.1 L), heated to 40-45°C and seeded with 4-(2-methyl-1 H-imidazol-1 -yl)-2,2-diphenylbutanenitrile phosphate. A solution of orthophosphoric acid (0.391 Kg, 3.39 mol) in acetone (2 L) was then added dropwise, maintaining temperature at 40-45 °C. Once the addition was finished, the reaction mixture was maintained 1 hour at 40-45 °C, cooled to 20-25 °C and stirred for 1 hour. The solid was filtered, washed with acetone (1 L), suspended in 2-propanol (10 L), heated at 80 °C and 2 L of solvent were distilled. The obtained suspension was then seeded with 4-(2-methyl-1 H-imidazol-1 -yl)-2,2-diphenylbutanenitrile phosphate solid Form I and maintained at 80 °C for 5 hours. The suspension was cooled down to 20-25°C, filtered off, washed with 2-propanol (1 L) and, finally, dried (45 °C, 0.5 torr, 12 hours). Optical microscopy: plate-shaped crystal habit as substantially in accordance to Figure 2. PXRD: Crystalline solid form as substantially in accordance to Figure 3. DSC (10 °C/min): Endothermic peak with onset at 177 °C (-1 18 J/g), as substantially in accordance to Figure 4. TGA (10 °C/min): Decomposition starting at 180 °C. DVS: No significant weight gain up to 90% of relative humidity. At this humidity, a total increase of only 0.45% in weight was observed. SCXRD: Crystal structure substantially in accordance to Figure 5. There are not water or solvent molecules in the crystal structure. Overactive Bladder (symptomatic overactive bladder, 0AB) is a common chronic lower urinary tract dysfunction. Its incidence, United States and Europe over 75 year-old male incidence up to 42%, slightly lower incidence of women 31%; the incidence of domestic in Beijing 50 years of age for men was 16.4% for women over the age of 18 mixed The overall incidence of urinary incontinence and urge incontinence was 40.4 percent, seriously affecting the physical and mental health of the patient, reduced quality of life. Common antimuscarinic drugs in vivo and in vivo M receptor in some or all of binding with different affinities to improve the symptoms of OAB, but will also cause many side effects, such as dry mouth, constipation, cognitive impairment , tachycardia, blurred vision and so on. Imidafenacin have diphenylbutanoic amide structure, is a new high anticholinergic drugs, which selectively acts on the M3 and Ml receptors, blocking the contraction of the detrusor choline, so detrusor relaxation, reduce side effects of drugs. 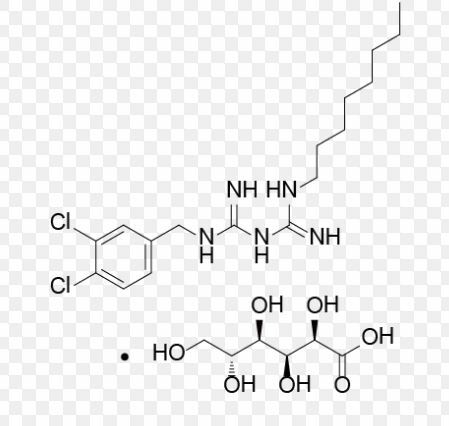 Meanwhile imidafenacin inhibit smooth muscle of the bladder and inhibiting acetylcholine free dual role, and selectivity for the bladder stronger than the salivary glands. The goods listed in June 2007 in Japan under the trade name: STAYBLA, chemical name: 4- (2-methyl-1-imidazolyl) _2,2- diphenylbutyric amide. BACKGROUND OF THE INVENTION This two-step method was 24% overall yield is too low, and the second step of the reaction is difficult to control. 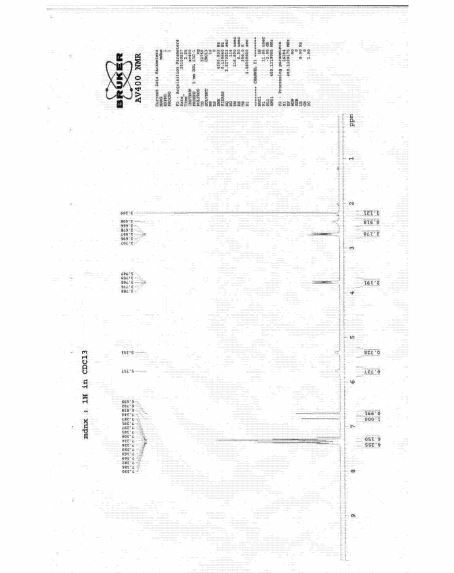 And the reaction product was purified by column chromatography required to obtain a purified product, is not conducive to industrial production. Chinese patent CN101362721A referred to as the hydrolysis conditions for the preparation of sulfuric acid and organic acid mixed use imidafenacin yield have mentioned the smell. Although this method increases the yield, but still more by-product of the reaction, the product is not easy purification. Japanese Patent No. JP2005 / 023216 proposes hydrolysis under alkaline environment, and the use of products and solutions of salts hydrochloride salt and then purified product. This method improves the yield of the second step of the hydrolysis reaction and simplified purification methods. But the need to use this method to purify salt activated carbon, and filtration devices require more stringent; and a need to be re-crystallized salt solution salt after the operation, a total of four steps of unit operations. Process more cumbersome and more stringent requirements for equipment, it is not conducive to industrial scale production. In addition, the product is dried for a long time, still remaining after solvent treatment product obtained, the purity of the product is still low. The following typical examples are intended to illustrate the present invention, simple replacement of skill in the art of the present invention or improvement made in all part of the present invention within the protection of technical solutions. 4- (2-methyl-1-imidazolyl) -2,2-diphenyl butanamide hydrobromide. The 16.5 g (52 mmol) 4- (2- methyl-1-imidazolyl) -2,2-diphenyl butyramide crude into 100 mL of isopropanol, stirring was added 8.0 mL hydrobromic acid and isopropyl alcohol mixed solution (volume ratio of 1: 1), the solid gradually dissolved, was nearly colorless and transparent liquid. After maintaining the reaction mixture was stirred for half an hour, the reaction mixture was added to 100 mL of ethyl acetate, stirred for I hour at room temperature, solid precipitated. Filtration, and the cake was rinsed with an appropriate amount of ethyl acetate. The solid was collected, 40 ° C drying oven and dried to constant weight to give 19.5 g white 4- (2-methyl-1-imidazolyl) -2,2-diphenyl butyramide hydrobromide, yield 98.9%. ?] \ 1 .228.4-229.00C0MS (m / z): 320 [M + 1] +. 1H-NMR (DMS0-1 / 6, 400 MHz) δ: 2.25 (3H, s), 2.73-2.74 (2H, m), 3.68-3.91 (2H, m), 6.81 (1H, s), 7.28-7.35 (I OH, m), 7.39 (1H, s), 7.49 (1H, d, /=2.4 Hz), 7.55 (1H, d, J = 2.2 Hz), 14.39 (1¾ br s). 4- (2-methyl-1-imidazolyl) -2,2-diphenyl butyramide. 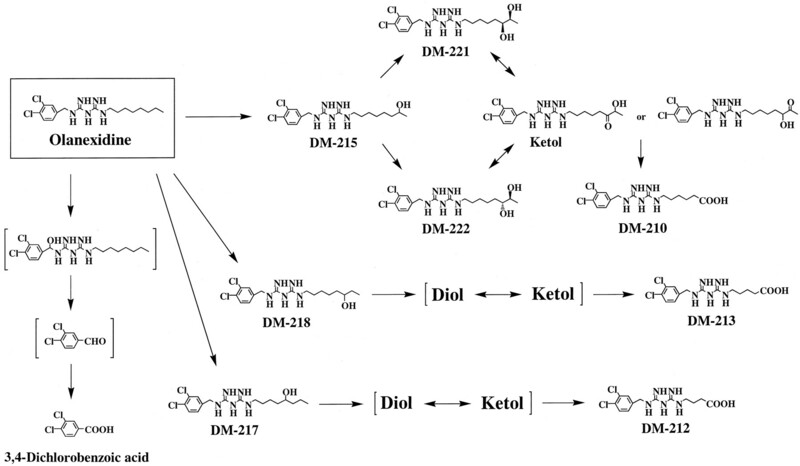 -2,2-Diphenyl butyric acid amide acetate was dissolved in 900 mL of water to 19.5 g (0.051mmol) obtained in Example 1 4- (2-methyl-1-imidazolyl) embodiment. Extracted with 900mL diethyl ether solution, collecting the inorganic layer. Was added to an aqueous solution of 200 mL of ethanol, was added to the system with stirring in an aqueous solution of KOH 2mol / L, there is a solid precipitated. The reaction was stirred I h after filtration. Cake was washed with 40% ethanol solution rinse, rinsed with water several times. Collect the cake, put 40 ° C drying oven dried to constant weight to give 14.8 g white 4- (2-methyl-1-imidazolyl) -2,2-diphenyl methylbutanamide, yield 91.0% (total yield 90% two steps). 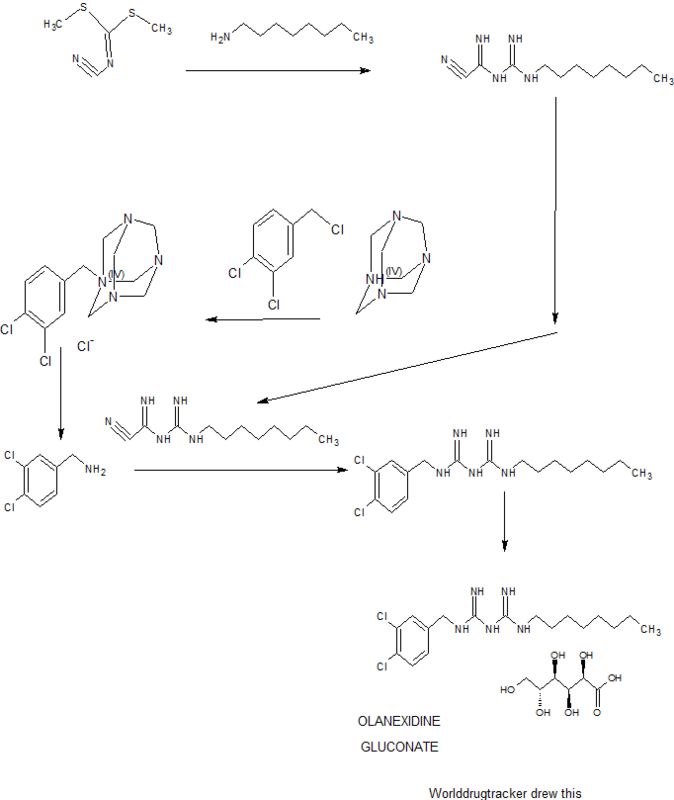 Μ.p.192.3-193.00C (CN101076521A 191-193O). MS (m / z): 320 [M + l] +. 1H-NMR (DMSO-J6, 400MHz) δ: 2.11 (3Η, s), 2.69-2.73 (2H, m), 3.61-3.65 (2H, m), 6.75 (1H, d, J = L OMHz), 7.01 (1H, br s), 7.04 (1H, d, J = L 0 MHz), 7.34-7.49 (11H, m). m), 3.61-3.65 (2H, m), 6.75 (1H, J = L 0 MHz), 7.34-7.49 (11H, m). Which preclude the use of the dilute sulfuric acid hydrolysis, although succeeded in getting the product, but the yield is very low, only 32%, greatly increasing the production cost, mainly due to 70% sulfuric acid, the reaction is difficult to control amide phase, the product will continue to acid hydrolysis byproducts, resulting in decreased yield. This method uses a lot of bases, product purification is too much trouble, and the total yield of 45%. The method used in the hydrogen peroxide solution, but a solution of hydrogen peroxide has strong oxidizing, and has a certain corrosive, inhalation of the vapor or mist respiratory irritation strong, direct eye contact with the liquid may cause irreversible damage and even blindness, security It is not high on the human body and environmentally unfriendly. Alkaline environment, easily decomposed hydrogen peroxide, as the temperature increases, the decomposition reaction increased, and therefore reaction requires a large excess of hydrogen peroxide solution. 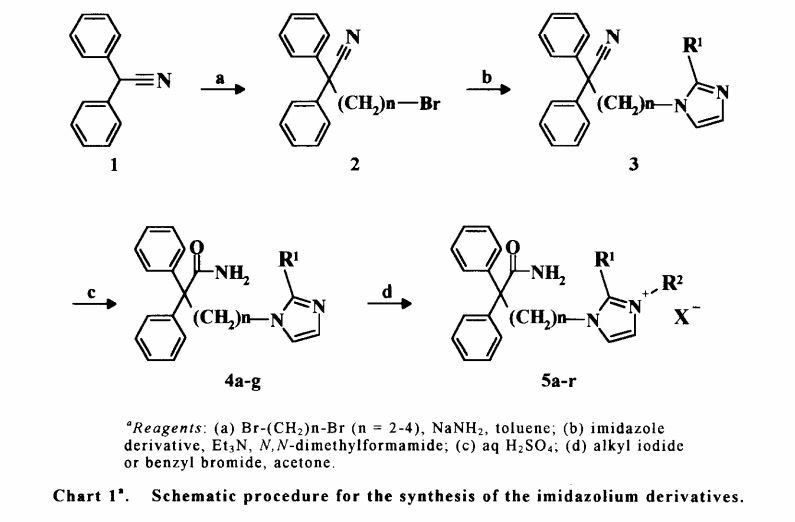 The method comprises the steps of: (1) 4-Bromo-2,2-diphenyl-butyronitrile is hydrolyzed to the amide under basic conditions; (2) The obtained 4-bromo-2,2-diphenylbutyric amide is reacted with 2-methylimidazole to give the desired product. 2L reaction flask was added 400mL of dry tetrahydrofuran, under a nitrogen atmosphere was added 60% sodium hydride (82.8g, 2.06mol), stirred to obtain a gray turbid solution A. With 400mL dry tetrahydrofuran was sufficiently dissolved diphenyl acetonitrile (200g, 1.04mol), I, 2- dibromoethane (204.2g, 1.08mol), to give a colorless clear liquid B; 5 ~ 15 ° C, a solution of turbid solution B dropwise to solution A, 10 ~ 15 ° C the reaction was incubated 6h, TLC until the reaction was complete, to the reaction system a small amount of water was added dropwise until no bubbles. After addition of 800mL water, 400mL ethyl acetate and stirred, liquid separation, the organic layer was washed with water, saturated sodium chloride solution, respectively, and the organic layer was dried over anhydrous sodium sulfate, suction filtered, concentrated under reduced pressure to give a yellow liquid 310g. The resulting yellow liquid with 800mL 90% ethanol and stirred to dissolve at 40 ° C, then cooling and crystallization, filtration, 45 ° C and concentrated under reduced pressure to give a white solid 232.8g, 75% yield. 3L reaction flask was added 4-bromo-2,2-diphenyl-butyronitrile (15 (^, 0.511101), 7501 ^ 6mol / L KOH solution, 750mL dimethylsulfoxide and heated to 100 ~ 120 ° C under stirring The reaction, the reaction lh, until the reaction was complete by TLC after cooling to 40 V, add 2000mL water, 2000mL of methylene chloride was stirred, liquid separation, the organic layer was washed with water, washed with saturated sodium bicarbonate and sodium chloride solution, separated, dried over anhydrous The organic layer was dried over sodium sulphate, filtration, concentrated under reduced pressure to give brown oily liquid 161.92g, 96% yield. 3L reaction flask was added 4-bromo-2,2-diphenyl-butyronitrile (150g, 0.5mol), 666mL 6mol / L NaOH solution, 750mL dimethylsulfoxide, the reaction mixture was stirred and heated to 100 ~ 120 ° C under The reaction lh, until the reaction was complete by TLC after cooling to 40 ° C, add water 2000mL, 2000mL of methylene chloride was stirred, liquid separation, the organic layer was washed with water, washed with saturated sodium bicarbonate and sodium chloride solution, separated, dried over anhydrous sulfate sodium organic layer was dried, filtration, concentrated under reduced pressure to give brown oily liquid 146.73g, 87% yield. The reaction was stirred 3L reaction flask was added 4-bromo-2,2-diphenyl-butyronitrile (15 (^, 0.511101), 8331 ^ 36% Na2CO3 solution, 750mL dimethylsulfoxide and heated to 100 ~ 120 ° C under The reaction lh, until the reaction was complete by TLC after cooling to 40 ° C, add water 2000mL, 2000mL of methylene chloride was stirred, liquid separation, the organic layer was washed with water, washed with saturated sodium bicarbonate and sodium chloride solution, separated, dried over anhydrous The organic layer was dried over sodium sulphate, filtration, concentrated under reduced pressure to give brown oily liquid 153.48g, yield 91%. 1.5mol), triethylamine (50.6g, 0.5mol), potassium iodide (5g, 0.03mol), fully dissolved with 1000mL DMF solution was heated to 120 ° C at a reaction 5h, until completion of the reaction by TLC, heating was stopped, to be After cooling, water was added 3000mL system stirred 0.5h, filtration, washed with water until the filtrate is neutral, concentrated under reduced pressure and dried to give a brown solid 146.14g, a yield of 91%. 1.011101), triethylamine (50.68,0.5mol), potassium iodide (5g, 0.03mol), fully dissolved with 1000mL DMF solution was heated to 120 ° C at a reaction 5h, until completion of the reaction by TLC, heating was stopped, the system was cooled until After adding 3000mL water, stirring 0.5h, filtration, washed with water until the filtrate is neutral, concentrated under reduced pressure and dried to give a brown solid 120.45g, 80% yield. 0.5h, suction filtered, washed with water until the filtrate was neutral, and concentrated under reduced pressure, and dried to give a brown solid 141.33g, yield 88%. 0.5h, after cooling the ethanol was distilled off to IOOmL about 500mL of ethyl acetate was added to precipitate a white solid, a small amount of ethyl acetate and wash the filter cake, 45 ° C and dried in vacuo to give 74.6g of white crystals, yield 93%. Alkylation of diphenylacetonitrile (I) with dibromoethane provided bromide (II). This was condensed with 2-methylimidazole (III) in the presence of Et3N in DMF to afford the substituted imidazole (IV). Finally, hydrolysis of the cyano group of (IV) with 70% sulfuric acid produced the target amide. Treatment of acetonitrile derivative (I) with dibromoethane (II) in toluene in the presence of NaNH2 affords bromo compound (III), which is then condensed with imidazole derivative (IV) by means of Et3N in DMF to provide compound (V). Hydrolysis of the cyano group of (V) with aqueous H2SO4 yields amide derivative (VI), which is finally subjected to alkyl quaternization by reaction with bromobenzyl bromide (VI) in acetone to furnish the desired product. 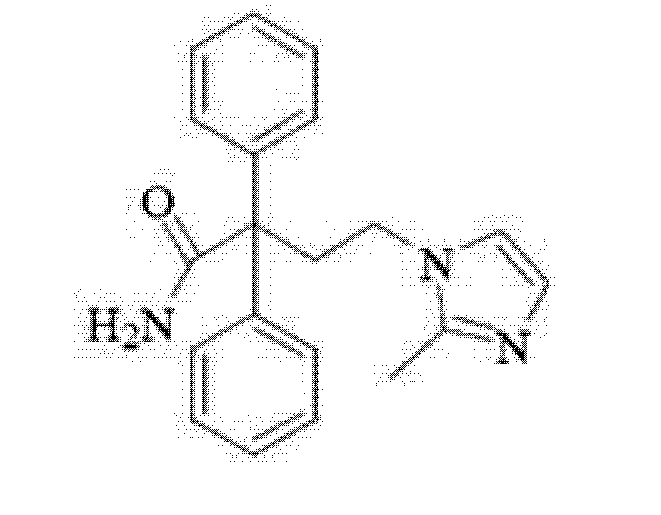 imidafenacin chemical name 4- (2-methyl–1H–1-yl) -2,2-diphenyl methylbutanamide (I). 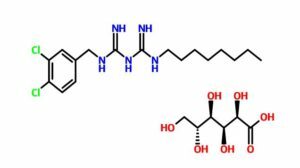 Condensation and hydrolysis reaction step to give imidafenacin (1). The new method is simple, mild reaction conditions, easy to control, good high yield and purity of the product, do not pollute the environment, suitable for industrial production. The 1,2_ dibromoethane (50ml), 2- methylimidazole (2.5g, 30.5mmol), tetrabutylammonium bromide (TBAB) (0.5g) and K2C03 (3.6g), K0H ( 4.6g) were added sequentially 100mL three-necked flask and stirred and heated to 50 ° C reaction 7h. Cooling to room temperature, the reaction solution was filtered, and the filtrate was washed with saturated aqueous sodium bicarbonate, dried over anhydrous sodium sulfate. Concentrated, added to a mixed solvent of isopropyl ether and ethyl acetate (3: 1) was stirred resolved crystal dissolved, to give the product 5.lg, yield 88.5%, mp.79_80 ° C.
The diphenyl acetonitrile (5.8g, 30mmol) and 50% aqueous KOH (15ml), dimethyl sulfoxide (DMSO) (100ml), tetrabutylammonium bromide (TBAB) (0.9g) in toluene 50ml was added to the reaction flask and stirred for 0.5h in the 40 ° C. 1- (2-bromoethyl) -2-methyl -1H- imidazole (4) (5.lg, 27mmol), was heated to 20 ° C, the reaction was stirred, TLC tracking and monitoring the reaction was complete, the mixture was poured into 100mL water, extracted three times with ethyl acetate 240ml water phase. Washed three times with 300ml of water The organic phase was dried over anhydrous sodium sulfate, the organic phase was concentrated. Analytical crystal solution with hydrogen chloride ether solution, filtered crystals with a mixed solvent of isopropyl ether and recrystallized from ethyl acetate to give the condensation product of 4- (2-methyl-1-imidazolyl) -2,2-diphenylbutyric carbonitrile hydrochloride (2) of a white solid 7.lg, yield 77.8%, mp: 156.5-158 ° C. 1H-NMR (400MHz, CDCl3), δ (ppm): 7.35-7.42 (IOH, m), 6.90 (1H, s), 6.77 (1H, s), 3.90-3.94 (2H, m), 2.75-2.79 ( 2H, m), 2.25 (3H, s). , 6.828 (s, 1H, Ar-H), 7.287-7.390 (m, I OH, Ar-H). 13C-NMR (CDC13,400MHz) δ: 12.17 (-CH3), 41.00 (-CH2 -), 43.74 (-CH2-), 59.44 (quaternary carbon, coupled with strong electron-withdrawing group), 119.08 (-C = C -), 126.95 (aromatic carbon), 127.88 (aromatic carbon), 128.52 (aromatic carbon), 129.10 (aromatic carbon), 142.61 (= CN), 144.54 (-C = N), 176.21 (carbonyl carbon). The 1,2_ dibromoethane (50ml), 2- methylimidazole (2.5g, 30.5mmol), tetrabutylammonium chloride (0.43g) and Na2CO3 (2.8g), NaOH (3.3g) followed by adding 100mL three-necked flask, stirred and heated to 40 ° C reaction 5h.Cooling to room temperature, the reaction solution was filtered, and the filtrate was washed with saturated aqueous sodium bicarbonate, dried over anhydrous sodium sulfate. Concentrated, added to a mixed solvent of isopropyl ether and ethyl acetate (3: 1) was dissolved with stirring parsing crystal give the product 4.9g, yield 85.1%, mp.79-80 ° C.
2-phenyl-butyronitrile hydrochloride (2) as a white solid 7.0g, yield 76.8%, mp: 156.5-158 ° C. 1H-NMR (400MHz, CDCl3), δ (ppm): 7.35-7.42 (IOH, m), 6.90 (1H, s), 6.77 (1H, s), 3.90-3.94 (2H, m), 2.75-2.79 ( 2H, m), 2.25 (3H, s). 3.747-3.788 (t, 2H, -CH2-CH2 -), 5.341 (s, 1H, -NH -), 5.757 (s, 1H, -NH -), 6.699 (s, 1H, Ar-H), 6.828 ( s, 1H, Ar-H), 7.287-7.390 (m, I OH, Ar-H). The 1,2_ dibromoethane (50ml), 2- methylimidazole (2.5g, 30.5mmol), benzyltriethylammonium chloride (TEBA) (0.35g) and Na2CO3 (2.8g), Na0H (3.3g) were added sequentially 100mL three-necked flask, stirred and heated to 45 ° C reaction 4h. Cooling to room temperature, the reaction solution was filtered, washed with a saturated aqueous sodium bicarbonate paint filtrate was dried over anhydrous sodium sulfate. Concentrated, added to a mixed solvent of isopropyl ether and ethyl acetate (3: 1) was dissolved with stirring parsing crystal give the product 5.0g, yield 86.8%, mp.79-80. . .
0.5h0 was added 1- (2-bromoethyl) -2-methyl -1H- imidazole (4) (5.lg, 27mmol), was heated to 60 ° C, the reaction was stirred, TLC tracking and monitoring the reaction was complete, the mixture was poured into 100mL of water and extracted three times with ethyl acetate 240ml water phase. Washed three times with 300ml of water The organic phase was dried over anhydrous sodium sulfate, the organic phase was concentrated. Analytical crystal solution with hydrogen chloride ether solution, filtered crystals with a mixed solvent of isopropyl ether and recrystallized from ethyl acetate to give the condensation product of 4- (2-methyl-1-imidazolyl) -2,2-diphenylbutyric carbonitrile hydrochloride (2) as a white solid 7.0g, yield 76.8%, mp: 156.5-158. . . 1H-NmrgoomHzADCI3), δ (ppm): 7.35-7.42 (10H, m), 6.90 (1H, s), 6.77 (1H, s), 3.90-3.94 (2H, m), 2.75-2.79 (2H, m) , 2.25 (3H, s). The 1,2_ dibromoethane (50ml), 2- methylimidazole (2.5g, 30.5mmol), tetrabutylammonium bromide (TBAB) (0.5g) and K2C03 (3.6g), K0H ( 4.6g) were added sequentially 100mL three-necked flask, stirred and heated to 60 ° C reaction 4h.Cooling to room temperature, the reaction solution was filtered, and the filtrate was washed with saturated aqueous sodium bicarbonate, dried over anhydrous sodium sulfate. Concentrated, added to a mixed solvent of isopropyl ether and ethyl acetate (3: 1) was dissolved with stirring parsing crystal give the product 4.5g, yield 78.1%, mp.79_80 ° C.
 The diphenyl acetonitrile (5.8g, 30mmol) and 50% aqueous KOH (15ml), dimethyl sulfoxide (DMSO) (100ml), tetrabutylammonium bromide (TBAB) (0.9g) in toluene 50ml was added to the reaction flask and stirred for 0.5h in the 40 ° C. Plus Λ 1- (2- bromoethyl) -2-methyl -1H- imidazole (4) (5.lg, 27mmol), was heated to 100 ° C, the reaction was stirred, TLC tracking and monitoring the reaction was complete, the mixture was poured into 100mL of water and extracted three times with ethyl acetate 240ml water phase. Washed three times with 300ml of water The organic phase was dried over anhydrous sodium sulfate, the organic phase was concentrated. Analytical crystal solution with hydrogen chloride ether solution, filtered crystals with a mixed solvent of isopropyl ether and recrystallized from ethyl acetate to give the condensation product of 4- (2-methyl-1-imidazolyl) -2,2-diphenylbutyric carbonitrile hydrochloride (2) as a white solid 6.7g, yield 73.4%, mp: 156.5-158 ° C. 1H-NMR (400MHz, CDCl3), δ (ppm): 7.35-7.42 (IOH, m), 6.90 (1H, s), 6.77 (1H, s), 3.90-3.94 (2H, m), 2.75-2.79 ( 2H, m), 2.25 (3H, s). The 1,2_ dibromoethane (50ml), 2- methylimidazole (2.5g, 30.5mmol), tetrabutylammonium bromide (TBAB) (0.5g) and K2CO3 (3.6g), K0H ( 4.6g) were added sequentially 100mL three-necked flask, stirred and heated to 20 ° C reaction 10h. Cooling to room temperature, the reaction solution was filtered, washed with a saturated aqueous sodium bicarbonate paint filtrate was dried over anhydrous sodium sulfate. Concentrated, added to a mixed solvent of isopropyl ether and ethyl acetate (3: 1) was dissolved with stirring parsing crystal give the product 4.1g, yield 71.2%, mp.79-80. . .
2-phenyl-butyronitrile hydrochloride (2) as a white solid 6.5g, yield 71.2%, mp: 156.5-158 ° C. 1H-NMR (400MHz, CDCl3), δ (ppm): 7.35-7.42 (IOH, m), 6.90 (1H, s), 6.77 (1H, s), 3.90-3.94 (2H, m), 2.75-2.79 ( 2H, m), 2.25 (3H, s). The 1,2_ dibromoethane (50ml), 2- methylimidazole (2.5g, 30.5mmol), benzyltriethylammonium chloride (TEBA) (0.35g) and Na2CO3 (2.8g), Na0H (3.3g) were added sequentially 100mL three-necked flask and stirred and heated to 40 ° C reaction 8h. Cooling to room temperature, the reaction solution was filtered, washed with a saturated aqueous sodium bicarbonate paint filtrate was dried over anhydrous sodium sulfate. Concentrated, added to a mixed solvent of isopropyl ether and ethyl acetate (3: 1) was dissolved with stirring parsing crystal give the product 4.4g, yield 76.4%, mp.79-80. . . The diphenyl acetonitrile (5.8g, 30mmol) and 50% aqueous KOH (15ml), dimethyl sulfoxide (DMSO) (100ml), benzyltriethylammonium chloride (TEBA) (0.66g) 50ml Toluene was added to the reaction flask and stirred 0.5h0 1- (2-bromoethyl) -2-methyl -1H- imidazole (4) at 40 ° C (5.lg, 27mmol), was heated to 50 ° C, the reaction mixture was stirred, TLC tracking and monitoring the reaction was complete, the mixture was poured into 100mL of water and extracted three times with ethyl acetate. The aqueous phase was 240ml. Washed three times with 300ml of water The organic phase was dried over anhydrous sodium sulfate, the organic phase was concentrated. Analytical crystal solution with hydrogen chloride ether solution, filtered crystals with a mixed solvent of isopropyl ether and recrystallized from ethyl acetate to give the condensation product of 4- (2-methyl-1-imidazolyl) -2,2-diphenylbutyric carbonitrile hydrochloride (2) as a white solid 6.8g, yield 74.6%, mp: 156.5-158. . . 1H-NmrgoomHzADCI3), δ (ppm): 7.35-7.42 (10H, m), 6.90 (1H, s), 6.77 (1H, s), 3.90-3.94 (2H, m), 2.75-2.79 (2H, m) , 2.25 (3H, s). , 6.828 (s, 1H, Ar-H), 7.287-7.390 (m, I OH, Ar-H). 13C-NMR (CDC13,400MHz) δ: 12.17 (_CH3), 41.00 (-CH2 -), 43.74 (-CH2-), 59.44 (quaternary carbon, coupled with strong electron-withdrawing group), 119.08 (-C = C -), 126.95 (aromatic carbon), 127.88 (aromatic carbon), 128.52 (aromatic carbon), 129.10 (aromatic carbon), 142.61 (= CN), 144.54 (-C = N), 176.21 (carbonyl carbon). ↵ a Chemical shifts are reported in parts per million. ↵ b Intensities are represented as number of protons. ↵ c Multiplicity: s, singlet; d, doublet; m, multiplet. ↵ d These proton signals could not be distinguished. ↵ e Coupling constants (J) are given in Hertz. ↵ f These carbon signals could not be distinguished. Chemical structures of [14C]imidafenacin and postulated metabolites, and their fragment ions. *, 14C labeled position; broken line, precursor and product ions obtained by collision-induced dissociation in LC/MS/MS. Kobayashi F, Yageta Y, Segawa M, Matsuzawa S (2007). 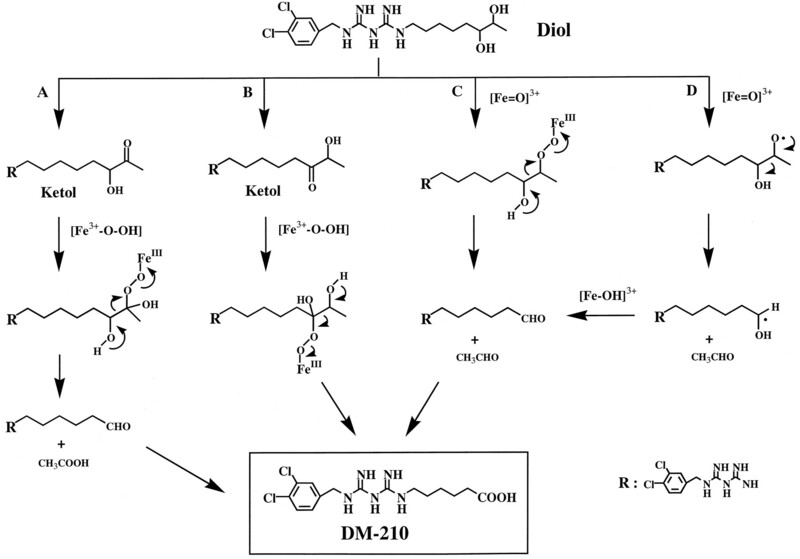 “Effects of imidafenacin (KRP-197/ONO-8025), a new anti-cholinergic agent, on muscarinic acetylcholine receptors. High affinities for M3 and M1 receptor subtypes and selectivity for urinary bladder over salivary gland”. Arzneimittelforschung. 57 (2): 92–100. doi:10.1055/s-0031-1296589. PMID 17396619. Miyachi H, Kiyota H, Uchiki H, Segawa M (June 1999). 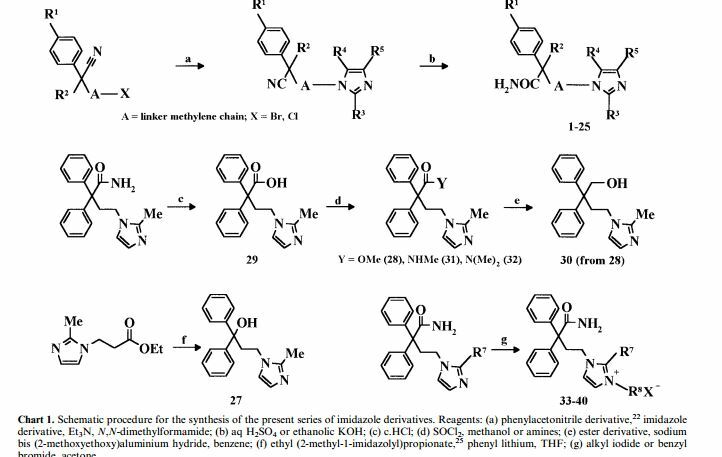 “Synthesis and antimuscarinic activity of a series of 4-(1-Imidazolyl)-2,2-diphenylbutyramides: discovery of potent and subtype-selective antimuscarinic agents”. Bioorg. Med. Chem. 7 (6): 1151–61.doi:10.1016/S0968-0896(99)00003-6. PMID 10428387. A disinfectant uesd to prevent of postoperative bacterial infections. Olanexidine gluconate was approved by Pharmaceuticals and Medical Devices Agency of Japan (PMDA) on Jul 03, 2015. It was developed and marketed as Olanedine® by Otsuka in Japan. Olanexidine gluconate is an antiseptic/disinfectant compound with potent bactericidal activity against Gram-negative and Gram-positive bacteria, for use in preparing patients for surgery and preventing of postoperative bacterial infections. Olanedine® is available as topical solution (1.5%), containing 3 g/200 mL, 0.15 g/10 mL and 0.375 g/25 mL, and the recommendation is applying appropriate amount of the drug. Otsuka Pharmaceutical Co., Ltd., Otsuka Pharmaceutical Factory, Inc.
A 1-g quantity of 1- (3, 4-dichlorobenzyl) -5-octyl biguanide dihydrochloride was dissolved in 15 ml of 10% ethanol, followed by refluxing for 5 hours. 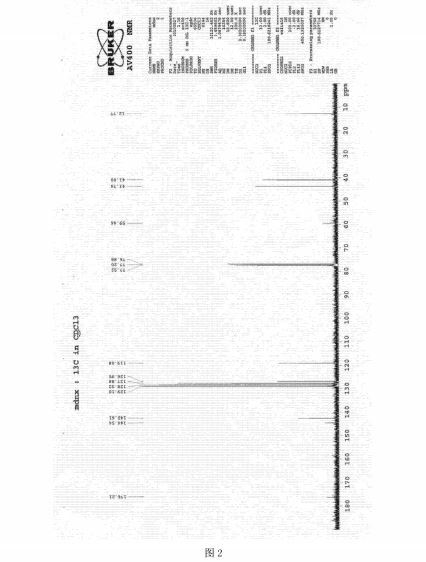 HPLC analysis was conducted under the conditions described below. (holding time: 10.54 minutes) was 0.22%. A 9.82-g quantity of Compound (2) (0.05 mol) and 10.63 g of 3, 4-dichlorobenzylamine (0.05 mol) were added to 49 ml of butyl acetate, followed by refluxing for 6 hours. The reaction solution was concentrated under reduced pressure, and a mixture of 12 ml of water and 47 ml of isopropyl alcohol was added and dissolved into the remainder. To the thus-obtained solution was added, dropwise, 10.13 g of concentrated hydrochloric acid. The resulting mixture was stirred at 28 to 300C for 30 minutes, and the precipitated crystals were then filtered out. The thus- obtained crystals were washed with a small amount of isopropyl alcohol, yielding 23.42 g of (non-dried) 1- (3, 4-dichlorobenzyl) – 5-octylbiguanide dihydrochloride. The resulting crystals were suspended in 167 ml of water without drying, the suspension was then stirred at 25 to 27°C for 2 hours, followed by separation of the crystals by filtration. The thus-obtained crystals were washed with a small amount of water and dried at 400C for 20 hours, yielding 17.05 g of 1- (3, 4-dichlorobenzyl) -5-octyl biguanide monohydrochloride 1/2 hydrate having a purity of 99.9% at a yield of 81.6%. -18- and the resulting suspension was heated under reflux for 3 hours. The reaction solution was cooled to about 200C, and the organic layer thereof was sequentially washed with about 500 ml each of (i) 5% hydrochloric acid, (ii) 5% aqueous caustic soda solution, (iii) 5% aqueous sodium bicarbonate solution, and (iv) water. Olanexidine is a compound with high bactericidal activity having the chemical name 1-(3,4-dichlorobenzyl)-5-octylbiguanide. Research has been carried out into bactericides containing, olanexidine hydrochloride as an active ingredient (see Japanese Patent No. 2662343, etc.). Olanexidine has very poor solubility in water, and hitherto known salts of olanexidine are also poorly soluble in water. For example, the solubility at 0° C. of olanexidine hydrochloride in water has been measured to be less than 0.05% (W/V), and the solubility of free olanexidine is a further order of magnitude less than this. Consequently, sufficient bactericidal activity cannot be expected of an aqueous solution merely having olanexidine dissolved therein, and moreover, depending on the conditions the olanexidine may precipitate out. In the case of making an aqueous preparation of olanexidine in particular, to make the concentration of the olanexidine sufficient for exhibiting effective bactericidal activity, and to reduce the possibility of the olanexidine precipitating out, it has thus been considered necessary to use a dissolution aid such as a surfactant. 20.9 g (50 mmol) of olanexidine hydrochloride hemihydrate was added to 250 mL of a 1 N aqueous sodium hydroxide solution, and the suspension was stirred for 1.5 hours at room temperature (25° C.). The solid was filtered off, and washed with water. The solid obtained was further suspended in 250 mL of purified water, the suspension was stirred for 5 minutes at room temperature, and the solid was filtered off, and washed with water. This operation was carried out once more to remove sodium chloride formed. The solid obtained (free olanexidine) was put into purified water in which 8.9 g (50 mmol) of gluconolactone had been dissolved, and the mixture was stirred at room temperature until the solid dissolved, and then purified water was further added to give a total volume of 300 mL. The concentration of olanexidine in the aqueous solution obtained was measured by using high performance liquid chromatography to be 6% in terms of free olanexidine. This aqueous solution was still transparent and colorless even after being left for several months at room temperature.